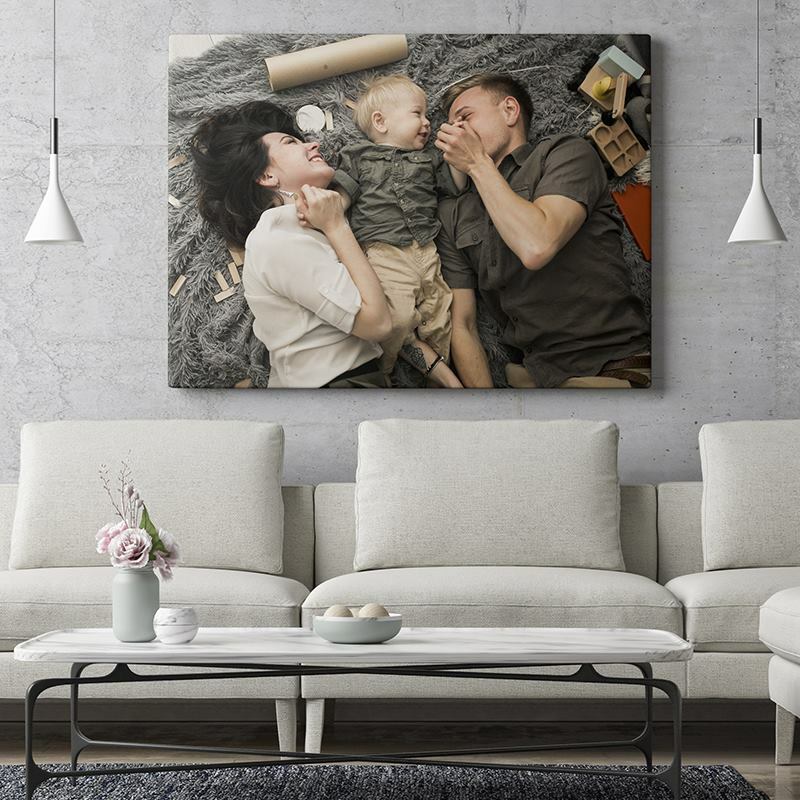 Create stunning next day canvas prints from your digital photos. Upload your photos and images, add text. Choose your size and preview your canvas print before you buy. What's more, if order before noon, we will print your canvas the same day. If you opt for next day delivery, canvas prints can turn from a dream to a reality overnight. Perfect for photos of faces, families and even beautiful landscapes. The finish to the sides and corners of the canvas means that the frame will not crack, tear, or split – even after many years of use. We use woven canvas and the image is fused into the fibres of the canvas textile; we're so confident in our work that we give a lifetime guarantee. Our unique photo canvas art prints are all made in our London factory, with high-quality canvas printing and build quality, few can match us on delivery, print and service. If you place your order before noon, on any working day (Monday to Friday) then we will print the same day, so with our next day, quick delivery option you can receive your canvas prints next day; turn your ideas into a reality in as little as 24 hours. A stunning way to showcase your photography blown up for great home decoration or a great Christmas, birthday or any special occasion gift. You can even design with your company logo and decorate the office. I’m over the moon with the Collage canvass i bought for Mothers day. Top quality and excellent delivery service. Canvas was beautiful. There was an issue with the delivery date, but following a conversation, this was sorted and arrived on the day promised. Great tools for setting out the design etc. I ordered a scattered photo collage. Process and delivery good. Unfortunately clarity of images at 30cm x 30cm, 25 images, not good. Make sure you blow images up if use. Acetate would be much better than canvas at that size. easy to use online design, resulting in a great personalised gift being manufactured and despatched extremely quickly. Unlike many other canvas companies, we print onto real woven canvas, a heavy canvas stock. We use dye sublimation, digital printing, which provides a deep and rich print. When it’s a case of your most precious photos, the ones you never want to forget, you need to be able to trust the craftsmanship. We use eight wedges for each canvas (many other companies will tell you that four is enough, but it really isn’t) and FSC stretcher bars. A rigid, robust stretched canvas print will give you peace of mind. The frame is hand-built and made from only FSC certified pinewood. Once the frame is ready, your custom design, printed with environmentally friends inks on woven canvas, is hand-stretched to ensure the best finish every time. You have a choice of frame depth - either 2.5 cm or 4.5 cm - and also a choice of wrap for your canvas. We use gallery wrap as standard, where the image continues and is wrapped around the sides of the frame (bleed). But we also offer a mirror or no wrap if you prefer, if this suits your image more. Read about wrap options. Add a message to the back of your canvas wall art if you like for the ultimate bespoke photo gift. As standard, our URLs will be printed on the back, however, you have four different options; you can choose to add your own message or not to add a message at all - both options come with or without our URLs. We love the idea of printing a personal message, or important date in that space. Our high-quality stretcher frames won't warp - guaranteed. You can even hang them in the bathroom without a problem. All of our wood is FSC certified from forests managed with consideration for people, wildlife and the environment.